Workhorse perennials like ornamental grasses can go unnoticed in the landscape until they enter their prime season when they transform into total showoffs. Some have showy plumes while others dazzle with their fall colors. Many grasses are valued for their winter interest, and they provide shelter and food for wildlife, too. Here are five of the very best. As gardeners, it is easy to get distracted by all the colorful blooms at garden centers in spring. Surely, showy flowers are essential in the garden, but they need a background to shine against. 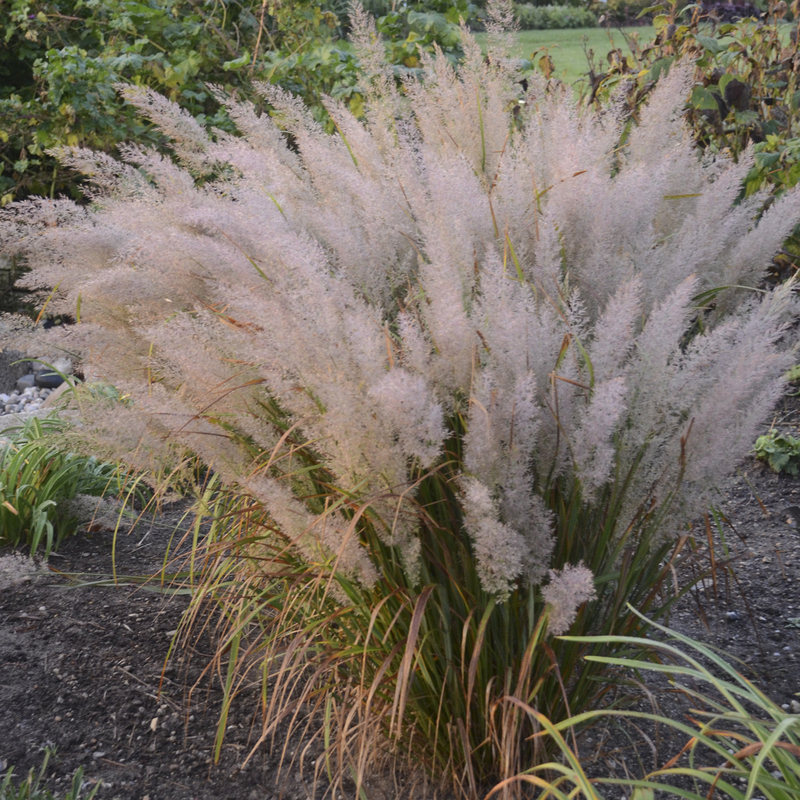 Shrubs often play that supporting role, but consider ornamental grasses, too. Grasses provide structure in the landscape and typically demand very little to thrive from year to year. In spring and summer, ornamental grasses provide a low-maintenance backdrop for annuals and perennials in the garden. As the flowers begin to fade late in the season, grasses step up their game and extend the show with their showy seed heads, fall colors, and graceful structure that often remains intact through the winter months. There's nothing quite like the sight of glistening frost clinging to their airy stems on a frigid winter morning. As much as we depend on ornamental grasses for visual interest in fall and winter, wildlife and birds also use them for shelter, warmth, and food during this time when those things are otherwise scarce. When spring comes, birds use the foliage to fortify their nests. 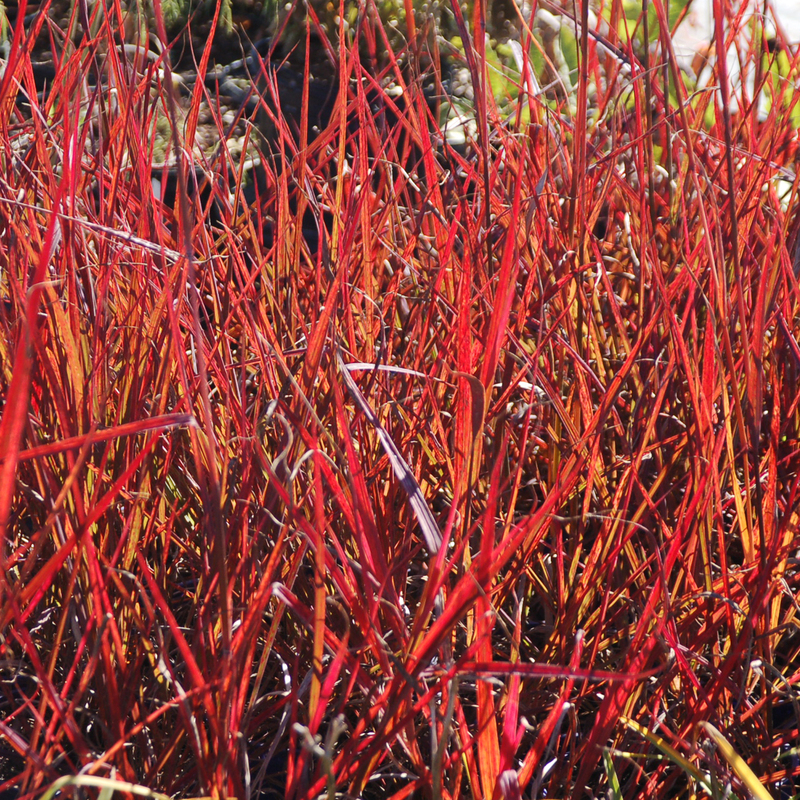 There are hundreds of ornamental grasses to choose from with a wide range of cultural needs, sizes and colors. It's a good idea to examine your options before you buy, so let's start by looking at five different types of ornamental grasses to find one that might be a perfect fit for your garden. Fountain grass is a classic fall blooming ornamental grass that gets its common name from its showy bottlebrush-shaped plumes, which emerge from the center of the foliage and arch outwards like a fountain. 'Desert Plains' blooms in early fall with larger plumes than the species, and develops appreciable red, orange and gold fall color. Pennisetum grows best in full sun and average to rich soil that is well-drained. You'll know it is too dry if the tips of the leaves turn brown. Height: 3-4'. Hardy in zones 5-9. Native Panicum switch grass is easy to grow in a wide range of climates, requiring only full sun to survive. It grows well in most soil types, from sand to heavy clay, and tolerates any amount of moisture. 'Cheyenne Sky' is a shorter selection that takes on deep red tones in summer, becoming nearly all red in fall. 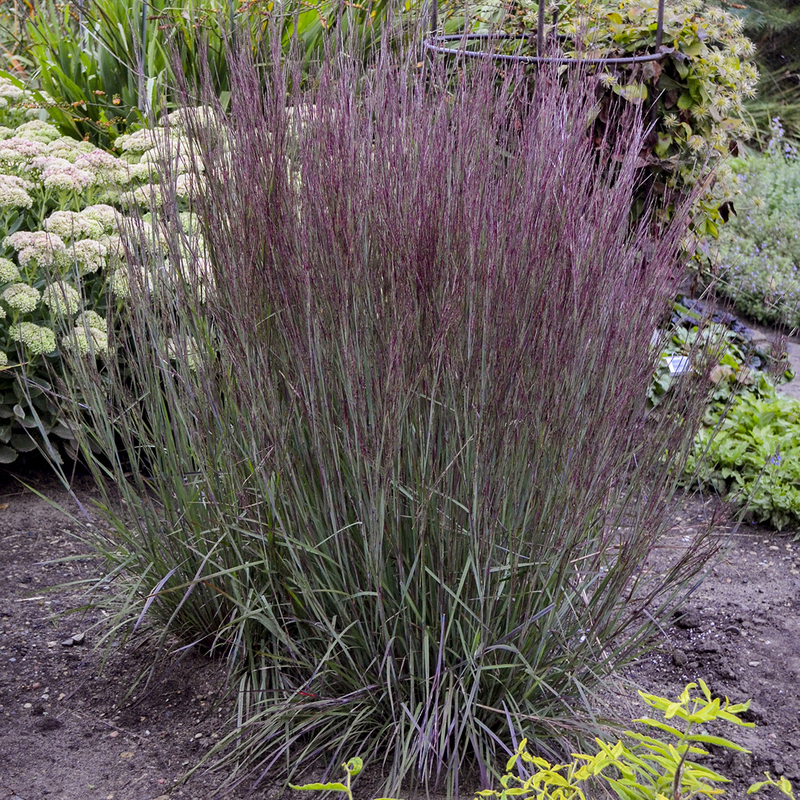 Airy purple seed panicles appear in late summer. Height: 3'. Hardy in zones 4-9. Korean feather reed grass is a rare shade tolerant ornamental grass that offers some height for the back of the flower border. In its native habitat, it grows in moist, deciduous woodlands, but this grass will also grow in full sun if watered regularly. It forms an upright clump of green foliage that is topped with feather duster-shaped plumes beginning in late summer. 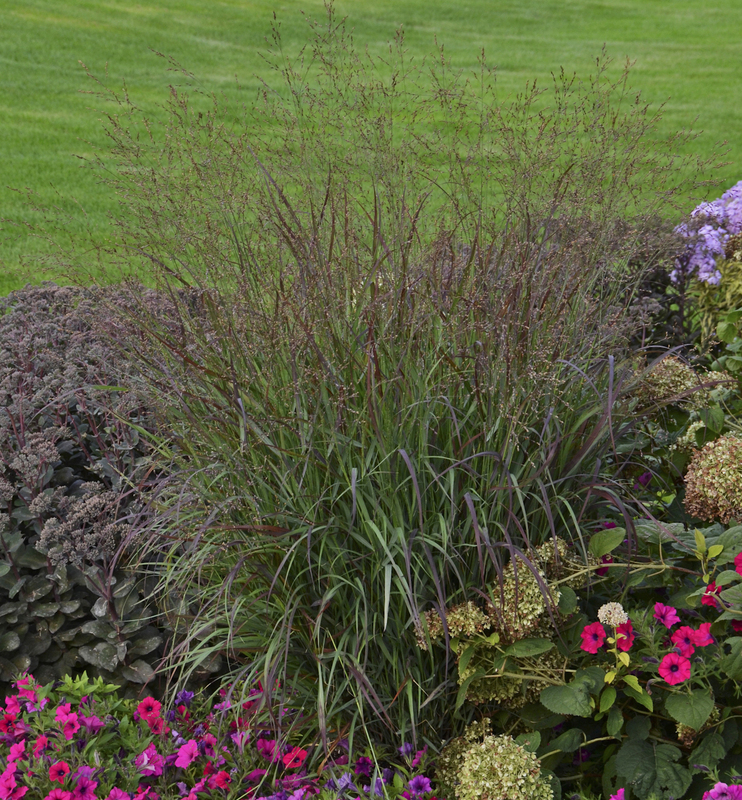 Use this grass as a backdrop for flowering perennials, and be sure to clip a few flower plumes for your fall bouquets. Height: 3-4.5'. Hardy in zones 4-9. Little bluestem is a prolific native grass that can be found growing wild across all North America except for Nevada and Oregon. Since the native species tends to become quite floppy in fall and has variable fall color, breeders have selected varieties with stronger stems and more intense fall color. One such selection is the new 'Blue Paradise'. Its silvery blue foliage forms a strictly upright column that turns deep wine red in fall. Like most little bluestems, its flowers are insignificant. Height: 3-3.5'. Hardy in zones 3-9. Photo courtesy of Intrinsic Perennial Gardens. Like little bluestem, big bluestem is a native grass that once dominated tallgrass prairies. It can be found growing in the wild all across North America except in the westernmost states and provinces. Its substantial root system makes it tolerant of wind and drought, though ideally it prefers some moisture. 'Red October' is a colorful selection that has deep green foliage with red highlights in spring and intense scarlet red fall color. Deep red seed heads appear well above the foliage in mid to late summer. Height: 5-6'. Hardy in zones 3-9. Want to learn more? 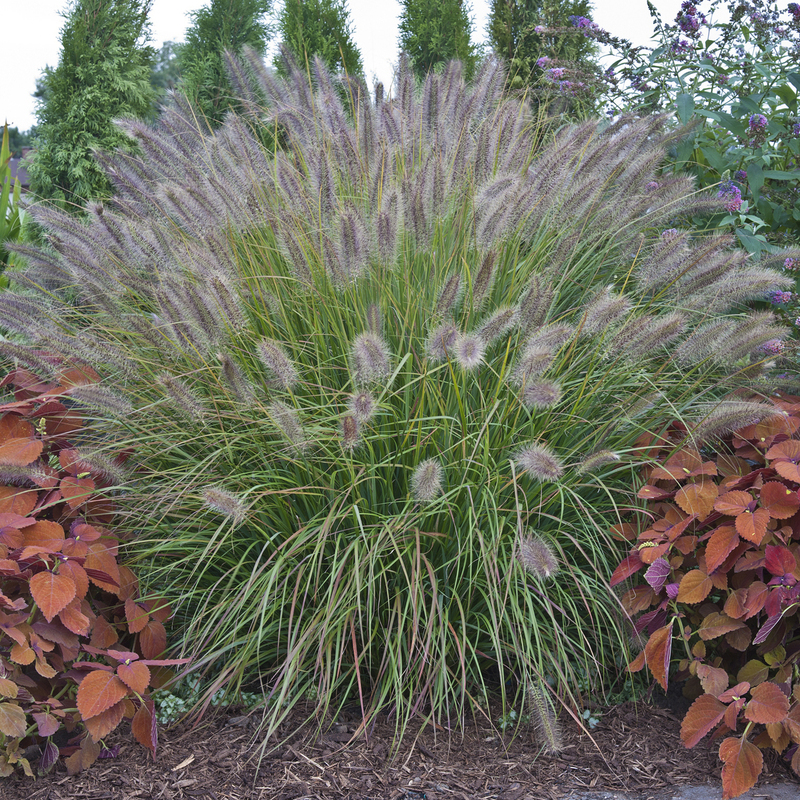 Search for additional annual and perennial ornamental grasses from Proven Winners® here. Patent Info: Prairie Winds® 'Desert Plains' Pennisetum alopecuroides USPP20751. Prairie Winds® 'Cheyenne Sky' Panicum virgatum USPP23209. Prairie Winds® 'Blue Paradise' Schizachyrium scoparium USPP28145 CanPBRAF. 'Red October' Andropogon gerardii USPPAF.